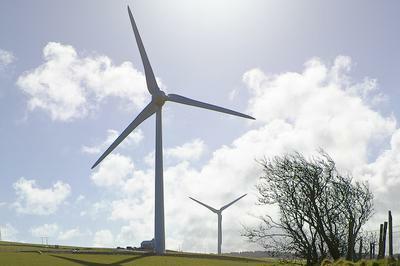 Proposals for building two new turbines close to two existing turbines near Ysgellog Farm, Rhosgoch on Anglesey are set to be presented to local residents. Airvolution Energy Limited, which specialises in developing small wind-energy projects, is investigating a site at Bodewryd Farm, Rhosgoch, and is inviting local people to find out more at community information days at the Amlwch Town Council Chamber on Tuesday 22nd October and Ysgol Gymuned Llanfechell School on Wednesday 23rd October. The company estimates that the Ysgellog 2 site is potentially suitable for two wind turbines. They would be up to 92.5m in height to the blade tip. In addition to generating a significant amount of clean, renewable energy, the wind turbines would also bring benefits to the local community. Airvolution has established a community benefit fund for the Ysgellog Farm wind project. The two established turbines will deliver £465,000 in community funding over the next 25 years. If the Ysgellog 2 turbines were approved, there would be an additional £20,000 per year to add to the community fund, worth £500,000 over the lifetime of the project. The combined community benefit fund for Ysgellog Farm turbines and the proposed Ysgellog 2 turbines would be £965,000 over 25 years. about the possibility of an additional two turbines. Our team will be available to explain what we are considering and to answer any questions about the projects and the community benefit fund,” said Alison Hood, Communications Manager at Airvolution. At the community information days there will be a ‘GrantScape’ Helpdesk to answer any questions and help groups with putting their applications together. GrantScape is the independent charity that administers the Ysgellog Community Benefit Fund. Groups within a 6km radius of the turbines are being encouraged to submit applications for the first round of funding, where over £63,000 is being made available from the Ysgellog Farm turbines. Submissions close on 28th October. During the construction of the two turbines at Ysgellog Farm, 35% of the construction spend stayed within Anglesey, representing a £316,000 spend on the island. In September 2013, the Ysgellog Farm turbines were announced as Wales Green Energy Awards finalists in the ‘Outstanding Green Energy Project’ category. The community information days take place at Amlwch Town Council Chamber on Tuesday 22nd October, 2pm to 7pm, and Ysgol Gymuned Llanfechell School on Wednesday 23rd October, 7pm to 9pm. Further details about Airvolution and the Ysgellog 2 project can be found at www.ysgellog2-wind.co.uk. For more local stories and articles, subscribe to our free Anglesey News here. It's a easy as 1-2-3! wind turbines add to the energy mix in Britain. the energy companies need the green subsidies otherwise it wont be profitable for them to develop renewables. customers have to pay for the new low carbon renewables like wind with higher bills. If people dont want to pay maybe they should stop supporting wind turbines and other alternative energy. "Wind is safe and free" says Ann. Free it ain't - we all pay for it thru our electricity bills & what's more it's useless and unreliable for generating electricity on any meaningful scale for the national grid. Does anyone seriously believe that wind power which stills needs back up from conventional power plants such nuclear, gas, etc.is anything but a scam perpetrated on a "green" in every sense of the word public, its development driven by subsidies stolen from consumers and reflected in their rising energy bills. I am against nuclear power so let's have wind. Do we want another Wylfa after Japan?? We dont want these ugly masts; let's have a new Wylfa!